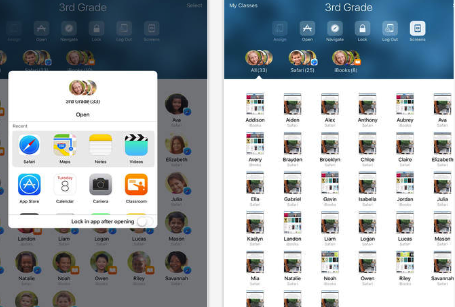 Apple has recently launched a new educational app called Classroom. This app is supposed to help teachers ‘guide students through a lesson, see their progress and keep them on track’. Classroom comes with a number of interesting features. For instance, you can use it to instantly launch apps, websites or even books on students' devices. You can also assign students to the shared iPads they have recently worked on and logged them off when they are done. Classroom provides you with smarter monitoring features so you can control what students are doing on their iPads. You can lock students’ devices into a single app or lock their screens. You can also see what each student is doing on their iPad or even view all students screens at once. And, if you use Apple TV in class, Classroom allows you to display students' work to the whole class. Alternatively, you can use AirPlay to wireless project a student’s screen to the class. As for organizational features, Classroom enables you to arrange students devices into groups and break students into different groups. It ‘automatically creates groups of students based on the apps they are using’. To use Classroom you need to have an iPad running iOS9.3 or later. Check out Classroom Guide to learn more about this app.